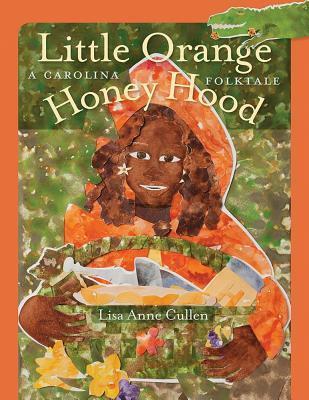 In this retelling of Little Red Riding Hood, a little girl named Blossom sets out to take a peach pie to her grandmother up the river. She encounters a wily alligator, and uses all her intelligence to outsmart him. I loved this funny retelling, with a decidedly Southern charm! I especially liked that Blossom does not rely on anyone else to save her and her grandmother, but instead she outsmarts the alligator herself. She’s a smart little cookie! There are even recipes included at the end of the book for peach pie and other Southern delicacies, like fried Alligator Tail. Haha! The illustrations are beautiful and unique, because they look like cut out pieces of paper. I liked the art style, but at times it was too busy and not clear enough. I found myself staring at the same page for awhile, squinting at the illustration, trying to figure out …is that a flower? Is that the little girl’s basket? A lot of the forest has all the same colors and everything blends in together. I would have liked more clean illustrations, and less busyness. Disclaimer: I received a copy of this book from the publisher in exchange for a free and honest review. All the opinions stated here are my own true thoughts and are not influenced by anyone. I always love it when there’s a recipe included in a picture book. Me too! I want to try the recipes, but don’t know where to get alligator meat. Haha!